Stay on top of work break laws that differ from state to state and city to city. Labor break laws differ from state to state, and even, in more recent years, from city to city. While federal law under the Fair Labor Standards Act does not require employers to provide rest or meal breaks for workers, many state and local governments do. 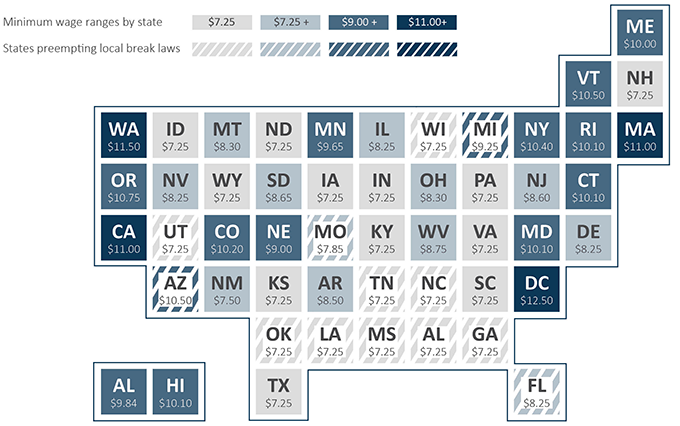 Employers who fail to comply with federal, state and local break requirements could incur hefty fines paid out to employees, so it’s imperative that businesses are aware of their state’s and city’s specific break laws. A handful of state governments have preempted the passing of local labor ordinances, while other states, like California, have encouraged them. Below, we’ve outlined the break laws in California and Washington, but employers should also be aware of local ordinances that differ from state and federal break laws, as well as exceptions based on industry. Employees who work at least 3.5 hours in a day are entitled to one 10-minute rest break. Those 10 minutes must be consecutive, paid and uninterrupted. Employees who work at least 6 hours in a day are entitled to two 10-minute breaks, and those who work over 10 hours are entitled to three 10-minute breaks. Rest breaks must also be spaced out so that they fall in the middle of each work period. This means if employees work 8 hour shifts, they should have one rest break before their meal break and the second rest break afterwards. Employers may require workers to stay on premises during their rest breaks, but they cannot be required to work during the 10-minutes. Employees do have the option to opt out of their rest breaks if they don’t want to take them. Because the meal breaks are unpaid and off the clock, employers cannot require their employees to stay on the premises during the 30 minutes. But employees do have the option to take paid, on-duty meal breaks, with their employer’s agreement. Breaks must be taken separately, which means employees can’t take a single hour-long break combining both of their meal breaks. If employers fail to offer a break, they must pay the employee an extra hour of work for each missed break, with a cap at two extra hours of pay. 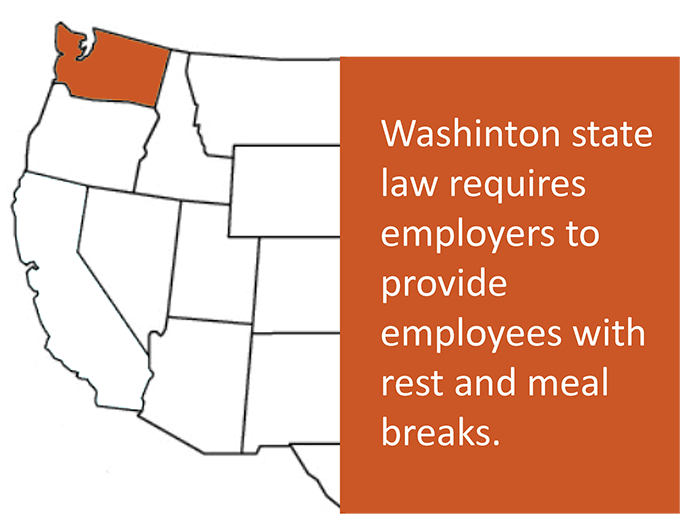 Washington’s rest break policy is similar to California’s, but with a few key differences. Non-agricultural employees are entitled to a paid, 10-minute rest break for every four hours they work. The breaks must be scheduled as close to the middle of the shift as possible, and employees cannot be required to work more than three consecutive hours without a rest break. 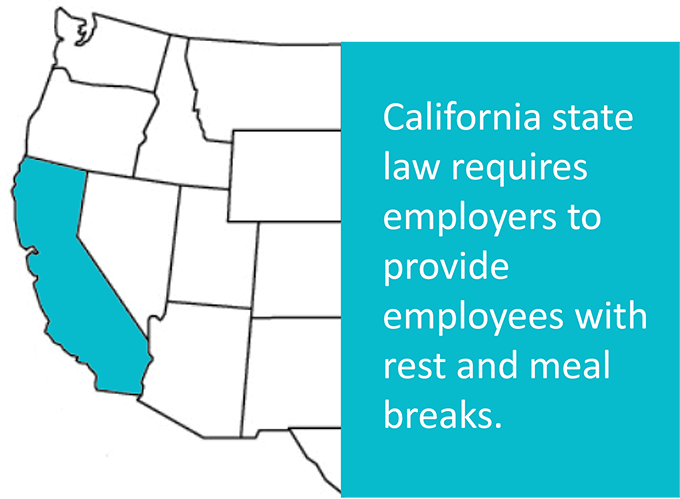 Employers are not required to offer rest breaks to employees whose positions naturally allow for intermittent breaks that meet the state’s minimum break requirements. Employers also have the option to offer multiple “mini breaks” that add up to a total of 10 minutes during each four hour shift, rather than one consecutive 10-minute rest break. The “mini breaks” can consist of activities like making personal calls, eating a snack or smoking. Employers are required to offer workers a 30-minute meal break for every shift of more than five consecutive hours. The meal breaks must be offered no less than two hours before the start of the shift, and no more than five hours after the start of the shift. If employees stay on-duty during this time, the breaks must be paid, otherwise the breaks are unpaid and employees are free to attend to their personal business during that time. If employees work more than three extra hours on top of their regularly scheduled shift, they’re entitled to an extra 30-minute meal break, either before or during the overtime. Meal and rest break laws can be tricky considering they vary so much from state to state and city to city, and it can create huge financial problems for businesses. Employers who fail to comply with meal and rest break laws could be sued for damages in the amount of wages for the total amount of break time they were entitled to. Employers could also be responsible for attorney fees, and it’s not unusual for multiple employees, or even an entire workforce, to bring a suit against an employer, so it’s essential for businesses to be aware of, and implement proper break policies as determined by their specific state or city laws.